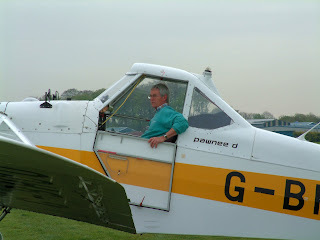 With a good high cloudbase it wasn't long before Alun J got the Pilatus out to push the envelope back a little bit, (You're going the wrong way Alun - Ed.) 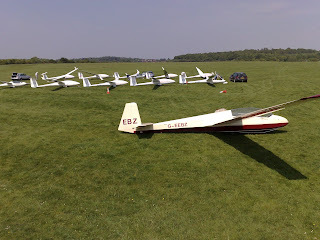 whilst JTU, 949, FUN and K4 tried their luck at soaring. 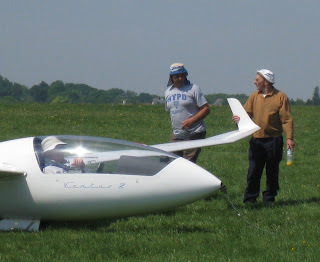 However aeros are no good unless you wind the clockwork up first as Gary finds out. Thanks Rob. The rumours were true! Geoff T did turn Land's End and got back to Exeter before needing some help from his "retrieve crew". "The convergence began just north of Tavistock and weaved about down the peninsular at times three to four kilometers out to sea. 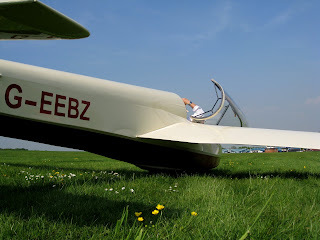 It was a very enjoyable ride and I even thought I might make it back without using the engine at all. No sooner had I said that than I ran into poor air north of Exeter and had to motor the last 217k back to Booker." 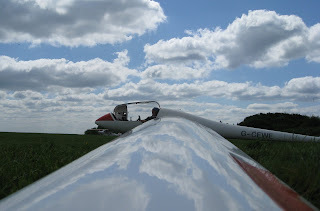 Paul B's 1000k declaration (Tiverton, Thetford, Taunton and home) certainly put the cat amongst the pigeons this morning as he launched at 9.00am into a very pretty looking sky. A grid formed, talked, examining the sky and the increasing spread-out as the morning developed. Almost two hours later they launched onto a mixture of 500k and shorter tasks. But the day didn't live up to it's early promise with only a handful getting round. 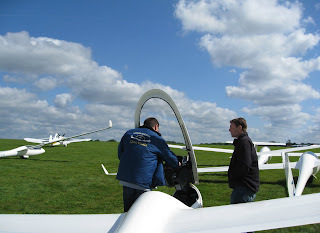 Jon Garfield explains to James the Pump why a throttle quadrant isn't necessary. Bob S with stylus in hand. Whatever happened to smoky barographs and a map? I was here first - Robin and Kite contest a thermal. Dave C pictured ready to start in what turned out to be a bit of a wet day all round. Jim W returns to base without troubling the retrieve crew. It's really important to look after our guests, particularly when they return and ask for the same instructor as last time. Well done Gerry! Well a day with a great forecast turned into survival exercise. It was obviously not going to be a large task day so a double O/R of 305k BOB-WEB-OXF-MAR-BOO was agreed as a reasonable compromise. The cu started to pop around 1300 and the grid, 161, A9, 325, 370, 918, M2, and (how does he do it T6) were launched. It looked like we were going to have a good afternoon flying a task in reasonable climbs to a height that is more than exceptionable in the UK. I went as soon as I’d reached the bottom of the airspace feeling that an empty Nimbus would have fun coming back into a freshening easterly. The run to Chievely was under well formed cu that gave confidence that the task wouldn’t be a problem, then a big hole appeared which only contained sparse raggedy cu. The result was a long glide to Marlborough worrying that getting down to under 2000ft was asking for trouble, but a climb to over 5000 gave a feeling of confidence in the day. Topping up at Devizes and then again at Westbury before heading back into wind it seemed that the day was going to be an enjoyable one. Whilst I was climbing at Devizes it appeared that T6, 161 and 325 were inspecting the ground relatively closely around Membury, but obviously managed to get back into the run of things as 161 and 325 passed me heading for Westbury as I was heading for Oxford between Devizes and Marlborough. Not long after this they were all turning Westbury. The sky looked good all the way from Lambourne, where I‘d had a good climb, to beyond Didcot and although I couldn’t see Oxford I didn’t envisage any problems. 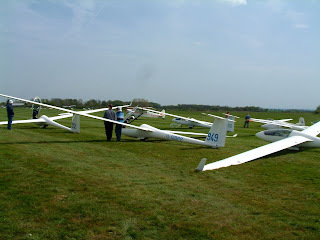 After gliding for over 30k passing under what looked like good climbs that didn’t offer any and listening to 370 saying he’d landed out (started turbo), T6 landing at Membury and 161 and 325 struggling to survive in the vicinity of Membury, it became obvious the day was falling apart. 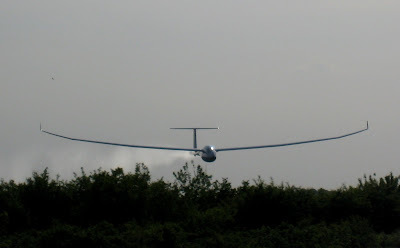 Oxford was off the menu and a scratchy climb around Chalgrove allowed me to glide home. 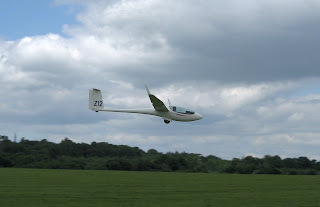 When I left the airfield nothing had been heard from 161 and 325 but T6 was being aerotowed by Ralph from Membury. Hope everyone got back okay. ... but more consistent. Another blue morning with broken lift up to a low 1200' inversion; some strong bubbles broke through to give narrow cores to 2000'; poor viz. Not the best for trial lessons! However the cu soon started popping with strong lift up to a high cloudbase. There was so much lift off Cressex that circuits were quite a problem for those on check flights, starting at 900' at the high key and ending at 1200' at low key. Round again please with a little brake this time. The grid launched and relaunched at lunch time with most getting back in the late afternoon albeit with turbo or relight. 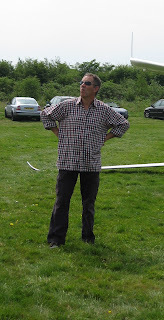 Meanwhile back at base, John Whiting soloed -well done John - and the Pegase, Junior, 21 and 13 were in constant use. Flat as the proverbial until lunchtime so no rush. Plenty of time to throw back the covers, top up the ballast, and have a couple of hands, all-in?!?. Nice weather for the BBMF to orbit east of the field before their run in to Runnymede. 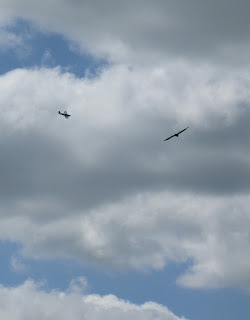 Quite a change from the rain which scrubbed last years flypast. Everyone got back, save Jim, whose tour of the fields of Oxfordshire continues. Most flopped back to base but some had a little energy to spare... Anyone fancy some more tomorrow? So, let's see if we reach the trigger teperature soon enough! Post launch update: Picture above shows the grid beginning to build up around lunchtime. Eventually launched as the first Cu began to pop at around 13:00. The Pundits declared Task B and did a full held start with the gate opening at 13:30. 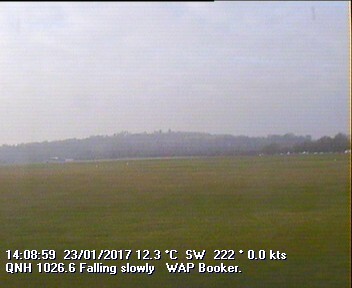 Meanwhile 732 had set off on the C task a little earlier (a bad decision as the air didn't become very thermic around the Oxfordshire plain until somewhat later). Quite annoying to listen to others moaning of airspace limits of only FL65 when you're scrabbling at 700'! 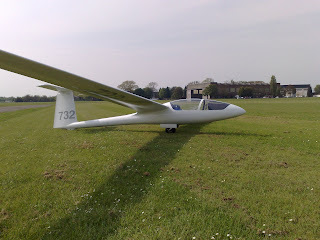 Not sure how the pundits went on with the B task but at least one (Z12) landed out near Oxford. 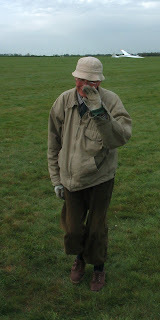 I think Jim is trying to get his annual set of landouts over with as early as possible in the year! Pity that the BGA Ladder is still down currently as it'll be interesting to hear what conditions were like elsewhere. Meanwhile I hope Mike-R re-posts his blog entry with people's soaring hats as it sounds really good! Doesn't take much much for Booker to strip off to shorts and don silly hats. Mind you some would say my beautifully tassled bobble hat which has seen many a Winter is just as silly. Judge for yourself. First up is Gary modelling the intellectual standard issue as he waits patiently for any tug, not just a Pawnee. Well done Ann. Nice adjustable brim in a style vaguely reminiscant of the Charleston era. Christian and his rather quaint pith helmet style. Steve modelling the BGA "Gliding" variety with a slightly Popeye theme. Gerry also seen sporting a non regulation cap. Dave C modelling the latest in Foreign Legion headwear and Rodney with a more nautical theme. And finally John wondering where he left his. Nice shirt though. No you didn't really think I'd post one of yours truly in bobble hat did you? Never the best of wind directions, but soarable nevertheless. Friday started damp and misty with some sharp showers moistening the grass. Just enough to raise the humidity when the sun finally made an appearance late morning. The grass was only cut last week but is growing fast along with the wild flowers. Weak blue thermals were the order of the day, but late afternoon saw some interesting clouds building from the East, with the hint of thunder in the distance. 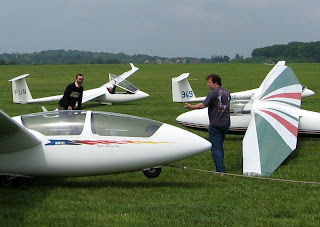 A good training day with Mike G working towards his bronze, Toufan getting the hang of circuits without an engine, Greg getting to grips with one of those awkward bad days which we all have from time to time and Roy G getting current again. Symeon took over the evening group at five with the prospect of a busy evening ahead if people could get to the airfield with the M40 shut. 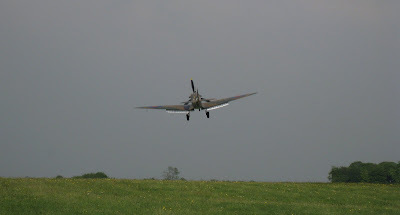 And finally who can resist a Spitfire piccie, not me, and no apologies. Just testing my new camera you know. The High over Scandinavia seemed to create havoc with the passing of the warm/cold/warm front in the early hours of Monday morning. 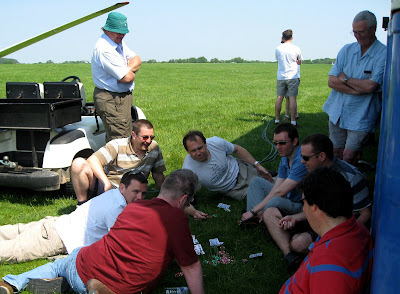 Nonetheless, several intrepid pilots rigged and gridded with the intention to go fly x-c.
Two main "tasks" were set - BOB-NOW-GRL-NOS-BOO for the grownups (Z12,T6,949 + 246?) which was around 246km. For the wussies, a.k.a. 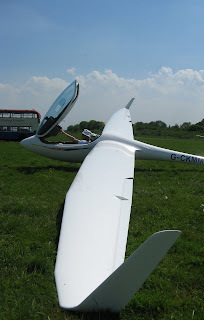 "oh, this is my first x-c of the season/first time I've flown the glider this year/just going to see if the instruments work" a more manageable BOB-BUC-DID-BOO of 119km was tasked. 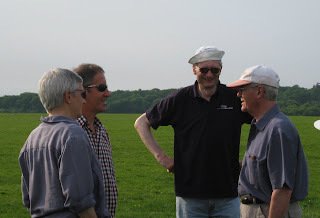 Feedback from the crew of the Falke WT which had just done a navex was that there were thermals around but the viz was poor and cloudbase around Didcot was around 1500'. Eeek! Anyway, 246 acted as the sacrificial lamb and was seen to be furiously thermaling and slowly climbing away, so the rest followed. 732, JDV& 971 elected for the shorter task and set off with good intent. After scrabbling around Brill for a while, 732 headed North for Bicester whilst JDV determindly pushed on towards Buckingham, turned short and landed at Thame. 971, cautiously tiptoed back to Booker. The Booker tug ended up with a grand tour of Oxfordshire, with Bob and Mark retrieving 732 and Z3 from Bicester and then JDV from Thame. 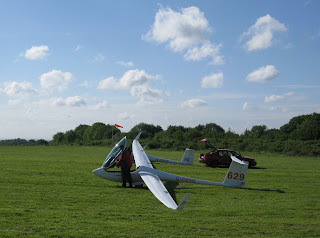 Not sure how the other group went on but FUN landed out near Didcot. Quite a challenging x-c day but lots of fun for everybody who at least had a go! Well I suppose we could have predicted the weather given its a Bank Holiday Weekend. At least it didn't rain (too much). Saturday dawned full of promise, the grid formed, the wind swung strongly to the South and we launched, albeit a little sideways on 06. That's about it really, some strong but patchy and largely unmarked lift with a strong Southerly wind aloft. Keeps you on your tows, which we did plenty of! Sorry. And speaking of tows, Rocky did his fair share. As did Gerry. And Mark and James the Pump and James the Third and Andy and Ed and Bob. Thanks guys. 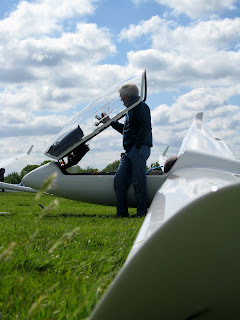 Sunday dawned more like Milk of Magnesia, so no grid, but at least we flew and it sounds like we faired better than our western neighbours, definitely and East/West split in the weather. Undeterred Phil C made the most of the conditions and completed his BI prep, good luck next weekend Phil! I like it when a trial lesson or intro course brings their supporters. Gets to be quite a day out with a carnival sort of atmosphere. Perhaps the tea bar should market picnics..... Which brings me to an apology. Sorry we're completely out of Mars Bars, Yorkies, Crunchies due to an excess of flying and not being able to do a cash and carry run.